Preheat oven to 350F. In a medium bowl, combine flour, baking powder, salt. In a large bowl, beat together sugar and butter until fluffy. Add egg and egg white one at a time mixing well after each. Then add vanilla, vodka, and 1/8 cup Kahlúa (half a shot). Gradually add flour mix in three additions, alternating with milk, ending in flour. Bake 17-20 min or until toothpick comes out clean. 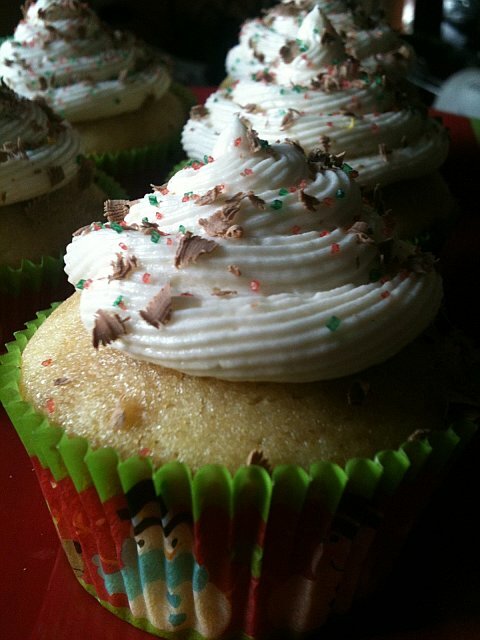 While cupcakes are still warm, brush top with remaining Kahlúa. Remove from pan to cool. Beat butter and sugar until creamy. Add salt, then add powdered sugar one cup at a time, beating until combined. Add Kahlúa one tablespoon at a time until desired consistency is reached.